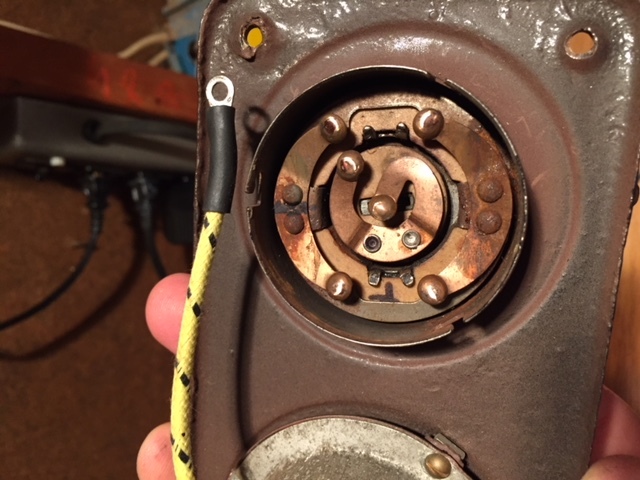 I’m having issues with my ignition switch so I would like to remove the back plate to clean things up. It’s the type with pins that stick through the slots in the housing. I do not think it’s ever been apart so I am worried if I force the pins that they’ll rip right out of the material. I thought about using some spray lubricant or solvent but I’m worried that might swell the fiber material and make it more difficult to remove. Any tips for removing it in one piece? It pops out like a bayonet light bulb. Push in and turn. Thanks Ted. I’ve never had one apart before and didn’t think to push in. Looks like a little cleanup is in order. Nice switch Dan! It looks like the back plate hasn't even started separating yet! Those layers of cardboard look great. 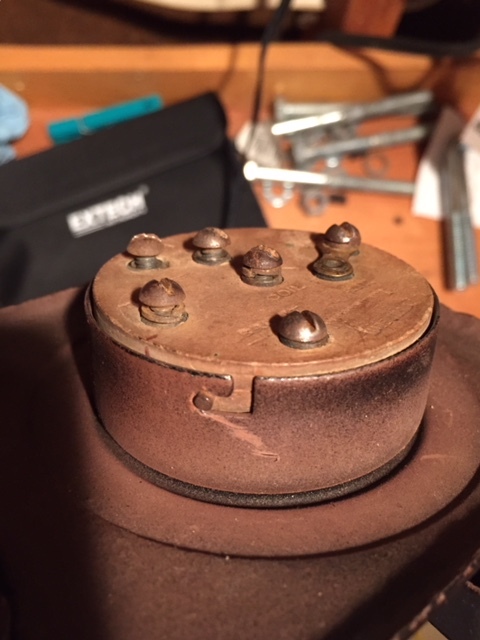 IF it ever starts separating, soak some super glue into the cracks, pop that section into the vise, snug it up just flat and tomorrow go on to the next pin. Then file the excess glue down and pop it back in. 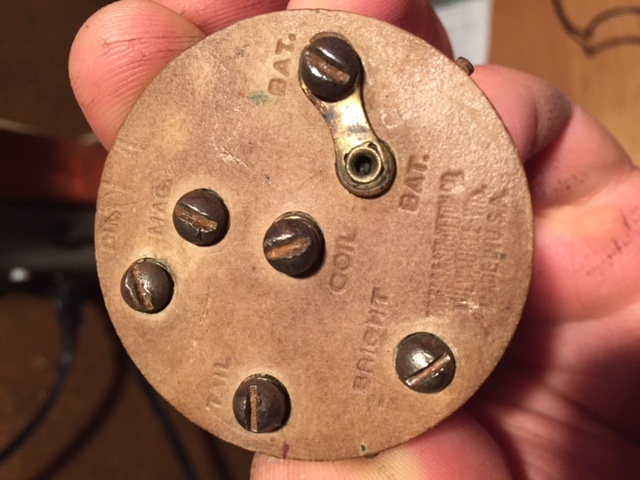 Is that a Clum or a Briggs and Stratton switch? I'm thinking a Briggs but perhaps the lettering is gone. Sand the contact side flat on a belt type sander. Don't use a belt sander! Put a piece of 120 on a surface plate or a good flat surface and hand sand it. If any of the pins are loose, simply put a little Crazy Glue on them. It will tighten things right up. Don't over do the sanding. Just enough to flatten as/if needed. 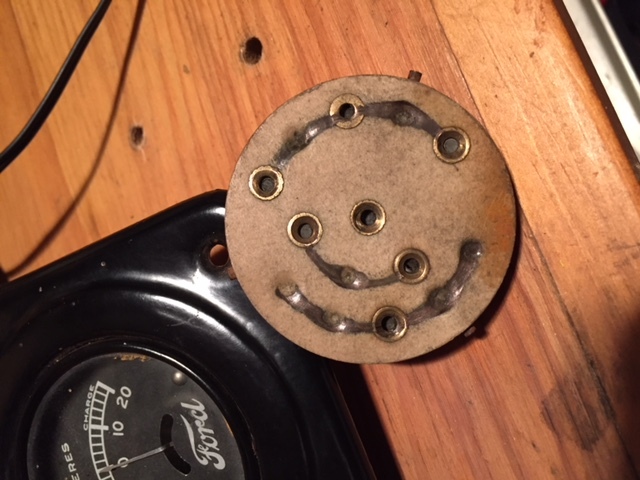 The hollows between the contacts will help clock the switch between the contacts. I wish mine looked as good! Thos dimples were not very deep on my switch, after I sanded it smooth. I got a small half round abrasive stone for my Dremel tool and put it in my drill press to set the depth and add the dimples back, all at the same depth. On the last one I fixed the dimples were too deep don't over do it. Actually I think it works just as good without them. Thanks all for the suggestions! It was cutting out all of a sudden when switching over to magneto but I could get it to stay running if I moved the headlight switch first. So I figure something was not quite making contact. My multimeter confirmed it at least half the time. 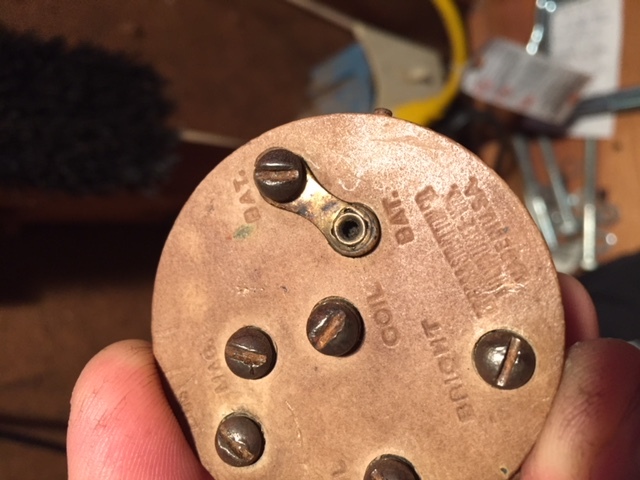 What’s the best way to clean the teeny tiny brass screws that thread into the back of the switch plate to hold on the wires? I’ve learned over time that using any kind of powered wire wheel turns small items into BB’s that shoot across the garage. It’s a Briggs and Stratton. I did not know they supplied parts to Ford and was very surprised to see it imprinted on the back. Here’s the best photo I could take. One of the best looking switch backs I've seen. You are lucky to have it. If you want it to look real nice use brass screws. Thanks! Not to belabor the point, but here’s a photo showing the complete back for anyone interested. Didn’t realize the one above was cut off. Dan, i cleaned the contacts by using a 'dull-ish' drillbit and holding it in my hand and with light pressure turn it til the contact is clean and shiny. Next i cleaned the contacts on the switch with some very fine sandpaper and ever so carefully bent them a little up to give them just a little more 'spring'. Thats all i did and it worked like a charm, the superglue is a good trick too but i dont think your switch needs it, it looks fine, just a little dirty. I think on most switches the cardboard is to fragile to use any powertool on it.